Season both sides of pork chops generously with Kosher salt and freshly ground black pepper. Lightly brush peach halves with oil. Heat grill over medium-high heat and lightly oil grill grates. I do this by folding up a paper towel and pouring some vegetable/canola oil on it. I then place paper towel on grates and use my grill brush to push the towel very quickly over them. Grill pork chops on grill, flipping once, until just cooked through. Grill peach halves, cut side down, until warmed through and you get those awesome looking grill marks! Meanwhile, stir together peach preserves, bourbon, apple cider vinegar, and onion powder in a small saucepan. Season with Kosher salt and place saucepan on grill along with pork. Bring to a boil and let simmer on the cool side of the grill for about 6-8 minutes. Alternatively, you can also do this part on the stove inside (bring mixture to a boil over high heat, then lower heat to maintain a simmer). During the last minute of cooking, brush peach bourbon glaze all over pork chops. 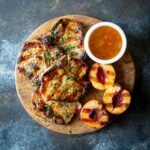 Serve pork chops with extra glaze and grilled peaches. Devour immediately!